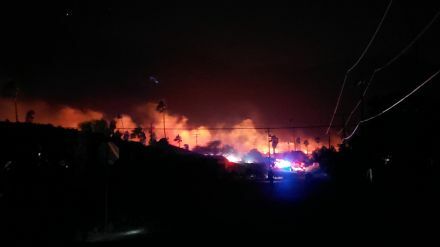 I was down in the Desert yesterday and last night and a fire broke out around 10pm in Palm Springs near the Tramway road. The winds were insane so I figured this thing was going to do some damage. Somehow they were able to stop it at 40 acres with no homes lost even though the winds were easily 30-40 mph. Sorry I didn't get very good media from the incident but you get the idea. 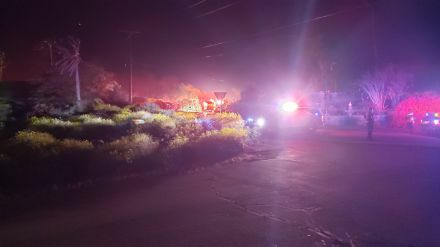 The fire started just west of Palm Canyon Road and Tramway Road. Very Densely populated with homes. Gorgeous, dramatic, terrifying photo. Thanks! Here's a little better photo! A video I took while at the scene of this fire..... You can most certainly tell its windy! What's up with fire in PS? We drove to Palm Desert yesterday. When we were even with where 111 splits off a BIG (approx 12in by 8-10in) burning ember of something landed on the road a couple of cars in front of us!! We swerved around it thankfully. It was gone before we could call 911 to report it! WTH?